This page is about the Russian fighter I-185 (M-82). For other version, see I-185 (M-71). The I-185 (M-82) is a rank III Russian fighter with a battle rating of 4.0 (AB/SB) and 3.7 (RB). 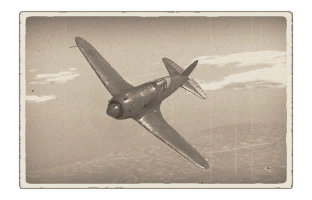 This aircraft was introduced into the game in Update 1.37. The I-185 (M-82) is most characteristic of a Russian version of an Fw 190, as its roll rate, climb rate, and dive acceleration are closely tailored to be used with Boom & Zoom. However, like many of the Yaks, it has no "great" distinguishing qualities and, although it is a great energy fighter, leans towards more of a jack-of-all-trades role. 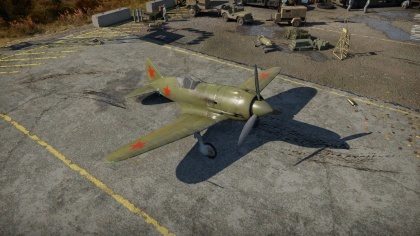 Like most Russian fighters, it has relatively poor high-altitude performance; however, it does have a higher usable ceiling than that of, say, the Yaks. Climb to 4 - 5,000 m and attempt to eliminate most opposition; avoid superior enemies such as the Bf 109 G/F or Spitfires Mk Vc/F Mk 9s. The I-185 (M-82) excels at Boom & Zoom, however, is extremely lacking when it comes to turn-fighting, as it will usually end tragically. If desperate, try rolling scissors, as it can be extremely useful due to the high roll rate, and the unique leading-edge slats give extra lift at low speeds. The visibility in the I-185 is relatively poor due to the low lying cockpit and "blind back"; therefore, always watch your tail in SB. Due to the high fire rate, you should always watch your ammo count. As a matter of fact, it is recommended to activate the "show ammo count" option in the "Interface" tab in the WT options, no matter what your plane. The nose-mounted armament can be extremely accurate due to the lack of spread. However, this can be a disadvantage as the lack of spread can mean a lack of hits for more inexperienced players in War Thunder. Additionally, the ShVAKs tend to spark quite a LOT, so players should always aim for the weakest parts of all planes. Make sure to attack from an angle when using the ShVAKs; attack from a close range as well. The armament is most effective at about 0.4 to 0.5km. Two of the most common enemies of the I-185 are the Bf 109 F and Fw 190 A. The Bf 109 will out turn you, as might the Fw 190 A-1. The more heavily armed A-4 is less agile but packs a far bigger punch. The German minengeschoß shells will easily destroy you, making the relatively lightly armed Bf 109 a huge threat already, regardless of the optional gun pods. If you are unlucky, however, you might bump into the Fw 190 A-5 and Bf 109 G-2. The A-5 should be treated similarly to the A-4. Its clear weaknesses can be exploited easily. The Bf 109 G-2 is much faster than you, climbs better and is more agile. Even if it carries gun pods, which are more effective than the ones the F-4 has, it still hugely outperforms you and has roughly the same armament, once again sporting the fearsome minengeschoß. Stay away from those. They easily rip your wings off, knock out your pilot, or set you on fire, quite often at the same time. Mediocre stock belts and terrible upgraded belts.